We have been heading in the a peculiar direction with technology. We are advancing our understanding of what lies out there for us to discover, and we are discovering a whole lot of it. We are moving very fast. We are advancing expotentially faster, better, and with larger discoveries with each new day. What was a cutting edge discovery last week, is a common place, well used tool today. Research scientists, hi-tech innovators, inventors, and tweekers of science are taking us further and further from science fiction to science reality with each blink of the eye. The Global Positioning System (GPS) has been available to the public since President Reagan declassified it in 1983, and with the exception of a couple of years during the first Gulf War when the military took it over again, it has been available to the public since 1993 when it was decided to make the system free to the entire world. Having a GPS system in ones car has become beyond commonplace. The little units that once sold for hundreds and hundreds of dollars can now be had for less than $100. Mapping technologies on the Internet such as Google Maps, and Bing can load directions directly into your cell phone. The cost of finding your way into today's world has gotten significantly cheaper, if not totally free in some cases. Then, with all of our advances, all of our new age discoveries, could someone spend a couple of bucks and fix the intercom to the boys down in marketing? Marketing folks are far from techies. The exist to market what needs to be sold. I received the above advertisement in an email from AT&T today. 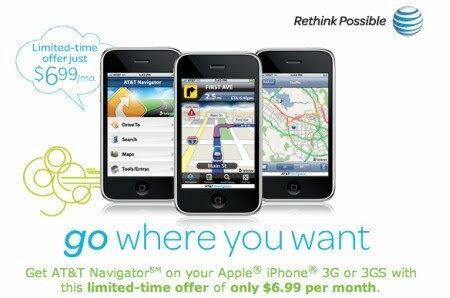 Imagine GPS in my cell phone!! And, for only $6.99 per month! A limited time offer!! Is it me, or is this totally ludicrous? I have an iPhone, and it has a map application on it. Came with it, for free. I can pinpoint my exact location, and get directions to anywhere. I can get the directions for driving, walking, or using public transportation. I also have a Garmin GPS for the truck. Big screen, out of the way up on the windshield, and I received it as a gift. Can't get any cheaper than that. So, as I was saying, could someone at AT&T check on the guys in Marketing, and while you're at it, make sure they are getting the company calendar, they seem to think it is still 1999.